Earlier this year, we announced that the Google Assistant will be coming to Android TV and it has arrived. 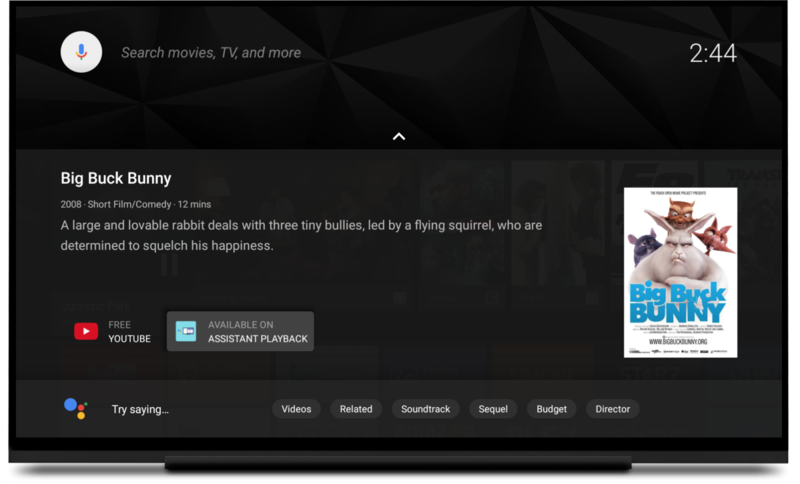 The Google Assistant on Android TV will allow users to discover, launch and control media content, control smart devices like light bulbs, and much more. Your Assistant also understands that you’re interacting on a TV, so you’ll get the best experience possible while watching your favorite movies and TV shows. The Google Assistant has a built-in capability to understand commands like “Watch The Incredibles”, and media controls, like pause, fast forward, etc. This article will walk through how to integrate the Google Assistant into your application. adb shell am start -a "android.search.action.GLOBAL_SEARCH" --es query "The Incredibles"
For specific searches such as “Play Big Buck Bunny”, the Assistant will present a card with a button for each app that exactly matched the search query. In the screenshot below, you can see the sample app, Assistant Playback, shows up as an option to watch Big Buck Bunny. There are times when the Google Assistant will launch an app directly to start playing content. An example of when this occurs is when content is exclusive to the app; “Play the Netflix original House of Cards”. You can test this by modifying and running the following adb command. If your app has a custom action, then replace android.intent.action.VIEW with the custom action. Replace the value of the -d argument with the URI you return from the Assistant’s query. For example, in the sample app, you can run the following command to launch playback of “Big Buck Bunny” as if the assistant had launched it.